An area I’ve noticed where engineers often forget to think about synchronization is where firing events. Now I’m going to go over a little background on C# delegates quickly just to refresh what we learnt or should have learnt years ago at the beginnings of the C# language. is to check the delegate (technically a MulticastDelegate, or in architectural terms the publisher of the publish-subscribe pattern (more commonly known as the observer pattern)) for null. When you declare a delegate, you are actually declaring a MulticastDelegate. The delegate keyword is an alias for a type derived from System.MulticastDelegate. When you create a delegate, the compiler automatically employs the System.MulticastDelegate type rather than the System.Delegate type. When you add a method to a multicast delegate, the MulticastDelegate class creates a new instance of the delegate type, stores the object reference and the method pointer for the added method into the new instance, and adds the new delegate instance as the next item in a list of delegate instances. Essentially, the MulticastDelegate keeps a linked list of Delegate objects. It’s possible to assign new subscribers to delegate instances, replacing existing subscribers with new subscribers by using the = operator. Most of the time what is intended is actually the += operator (implemented internally by using System.Delegate.Combine()). System.Delegate.Remove() is what’s used when you use the -+ operator on a delegate. // Bug: assignment operator overrides previous assignment. // if using the event keyword, the assignment operator is not supported for objects outside of the containing class. Another short coming of the delegate is that delegate instances are able to be invoked outside of the containing class. in the form of the event keyword. The event keyword address’s the above problems. The following is an example from the GoF guys with some small modifications I added. You’ll also notice, that the above inadequacies are taken care of. Now if the Stock.OnChange is not accessed by multiple threads, this code is fine. If it is accessed by multiple threads, it’s not fine. 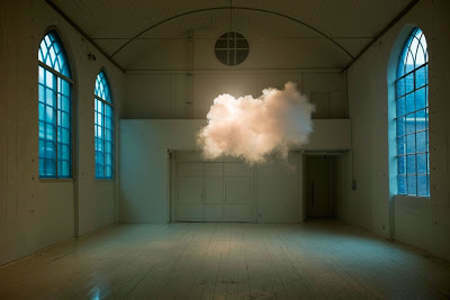 and when Change is fired, Change could be set to null, by another thread. This will of course produce a NullReferenceException. The code on lines 59,60 is not atomic. At least we don’t have to worry about the += and -= operators. They are thread safe. Ok. So how do we make it thread safe? Now I’ll do my best not to make your brain hurt. We can assign a local copy of the event and then check that instead. How does that work you say? The Change delegate is a reference type. thus any changes to Change would also be reflected in threadSafeChange. which has no effect on the original MulticastDelegate that threadSafeChange also references. The reference part of reference type local variables is stored on the stack. (whether its an instance or static method). so long as they are not reference types being passed to another thread or being passed to another thread by ref. So, only one thread can access the threadSafeChange instance. If one subscriber throws an exception, any subscribers later in the chain do not receive the publication. One way to get around this problem, is to semantically override the enumeration of the subscribers. Thus providing the error handling. // what we do here depends on what stage of development we are in. // if we're in early stages, pre-release, fail early and hard. Bear in mind, there are additional overloads for most/all of the following procedures. Ensures that a condition is true when in debug mode. Instructs code analysis tools to assume that the condition supplied as an argument is true, even if it can not be statically proven to always be true. Good example of how this can be used. Must be at the beginning of a method or property. Ensures that a condition is true before any other code. The following example ensures that MyInput parameter is valid (not null in this case) before any other code is run on the same thread. Is used to inform the compiler to treat all code before it as if it was a code contract. This is useful for legacy code. For example if you have parameter validation code that does not use Code Contract’s. and the set of such statements are followed by a Contract method call, such as Requires, Ensures, EnsuresOnThrow or EndContractBlock. Ensures that a condition is true on exit of a method or property. This method call must be at the beginning of a method or property, before any other code. If an exception is thrown, the specified condition must be true and the exception being thrown is of the specified type parameter. Allows the iteration through a collection to ensure all members meet a specific requirement. Used to mark methods that contain object invariant specifications. 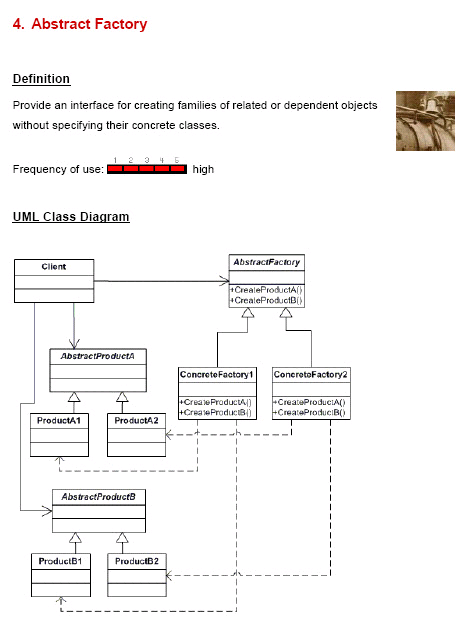 Defined by decorating a method with the ContractInvariantMethodAttribute. 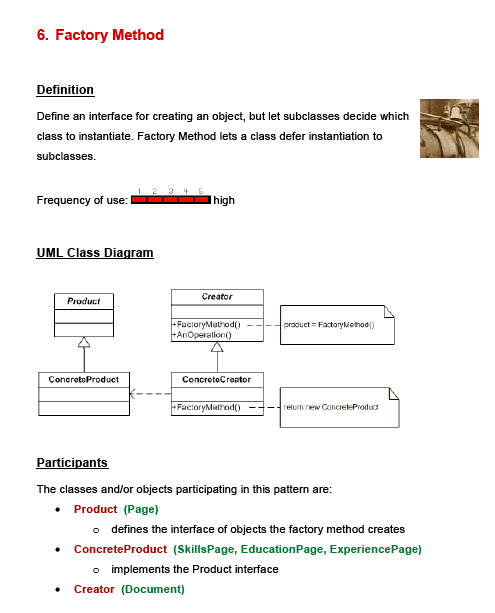 ContractInvariantMethodAttribute can only be used on a single method per class. There are also some useful pseudo variables that can be used when writing postconditions. Contract.Result<T>() can be used only in the conditional expression for the Ensures contract. Methods with a return type of void cannot refer to Contract. Result<T>() within their postconditions for the obvious reason. Contract.OldValue<T>(T value) can be used only in the conditional expression for the Ensures contract. The generic type argument may be omitted whenever the compiler is able to infer its type. There are a few restrictions around the use of OldValue. Have a look at the User Manual document. Listed at the end of the post. Using the PureAttribute indicates that a type, method, property, etc is pure, that is, It has no visible side-effects for callers. You can only use a method/property/etc in a contract if it is declared Pure. If the method/property/etc is not decorated with this attribute when called from within a contract, a warning will be given “Detected call to impure method”. See this post, it has a good example. Contracts for interfaces must be defined in a separate class decorated with the ContractClassForAttribute. The interface sporting the contract must be decorated with the ContractClassAttribute specifying the type that has the interfaces contract. 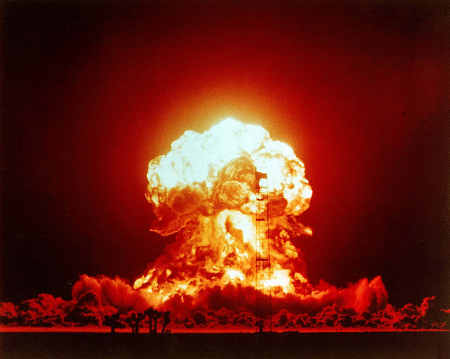 The class that implements the interfaces contract is expected to be abstract. The User Manual listed at the end of this post has some good examples of how to set up Interface Contracts. 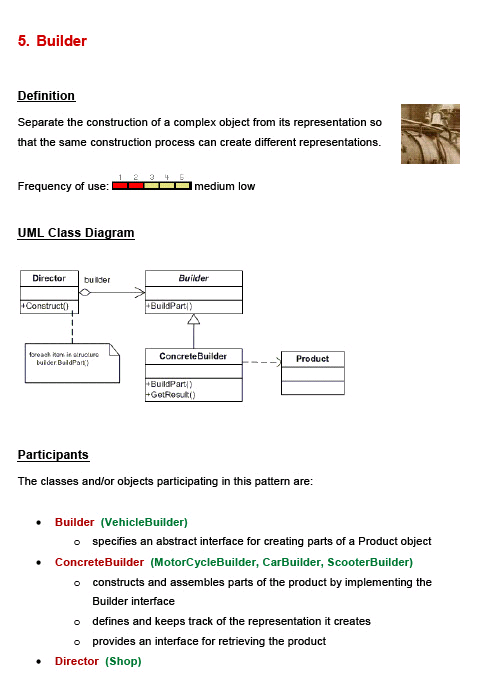 Lets keep our Object Oriented relationships adhering to the LSP and the DbC. Hierarchical components that behave the same across all layers. Systems that produce predictable results on a layer, from changes made on another layer (providing architecture that can be reasoned about). As programmers, we need to be able to make correct assumptions about the behaviour of abstract data types and their derivatives. LSP and DbC provide us with the ability to create intuitive class hierarchies that support the object oriented architectural reasoning process. Extensible code. Ability to add functionality without having to change existing code, but rather extending it. The LSP states that you shouldn’t inherit from a base class unless the derived class truly “is a” more specific version of the base class (Liskov 1988). Subtype objects must be behaviourally substitutable for supertype objects. Programmers must be able to reason correctly about and rely upon the behaviour of subtypes using only the specification of the supertype behaviour. Robert C. Martin wrote this excellent article on LSP. Which I found here along with many other great articles. In other words, all the routines defined in the base class should mean the same thing when they’re used in each of the derived classes. If you have a base class of Account and derived classes of CheckingAccount, SavingsAccount, and AutoLoanAccount. A programmer should be able to invoke any of the routines derived from Account on any of Account’s subtypes without caring about which subtype a specific account object is. If a program has been written so that the LSP is true, inheritance is a powerful tool for reducing complexity because a programmer can focus on the generic attributes of an object without worrying about the details. If a programmer must be constantly thinking about semantic differences in a subclass implementation, then inheritance is increasing complexity rather than reducing it. This goes against software’s primary technical imperative of managing complexity. because the semantics of the InterestRate() routine are not the same as the semantics of the base class’s InterestRate() routine. From my understanding. DbC provides constraints which enforce the LSP. LSP is notional. DbC provides us with the practical approach. .Net 4.0 gives us Code Contracts which directly support the DbC principle. In looking at what the .Net framework 4.0 provides us with in the System.Diagnostics.Contracts namespace. Bear in mind, this is not a language extension or a runtime extension. It’s just a library. I think that using the static class’s in your code, that System.Diagnostics.Contracts provides would be a prime candidate for Aspect Oriented Programming. It looks like the .Net CLR has support for AOP, although it doesn’t sound like it has been implemented very cleanly. IMHO, when using AOP, the actual business code utilising the aspects, should not show any signs of the aspects (Code Contracts (in our case)). Although it looks like there are some open source alternatives that do the job quite nicely. Anyway, without diving into AOP, lets save it for another post and move on. DbC is actually a registered trademark of Eiffel Software. Bertrand Meyer when designing the Eiffel programming language came up with this term. DbC provides us with class invariants, preconditions and postconditions. C# for artists by Rick Miller has a good explanation of these. A class invariant is an assertion about an object property that must hold true for all valid states the object can assume. For example, suppose an airplane object has a speed property that can be set to a range of integer values between 0 and 800. This rule should be enforced for all valid states an airplane object can assume. All methods that can be invoked on an airplane object must ensure they do not set the speed property to less than 0 or greater than 800. A precondition is an assertion about some condition that must be true before a method can be expected to perform it’s operation correctly. For example, suppose the airplane object’s speed property can be incremented by some value and there exists in the set of airplane’s public interface methods one that increments the speed property any where from 1 to 5 depending on the value of the argument supplied to the method. For this method to perform correctly, it must check that the argument is in fact a valid increment value of 1,2,3,4, or 5. If the increment value tests valid then the precondition holds true and the increment method should perform correctly. The precondition must be true before the method is called, therefore it is the responsibility of the caller to make the precondition true, and the responsibility of the called method to enforce the truth of the precondition. A postcondition is an assertion that must hold true when a method completes its operations and returns to the caller. For example, the airplane’s speed increment method should ensure that the class invariant speed property being 0<=speed<=800 holds true when the increment method completes its operations. Code Contracts can run on .Net 4.0 or previous versions. Express assumptions and constraints, I.E. the object invariants, pre and post conditions. Checks for implicit contracts, such as null dereferences and checking array bounds, as well as the explicit developer provided contracts. Only available in Microsoft’s Premium edition or above of Visual Studio. modifies the IL by injecting the contracts. Once you’ve installed either the Standard or Premium Edition of the managed code contracts from DevLabs. Projects within Visual Studio will now have an extra property pane entitled “Code Contracts”. 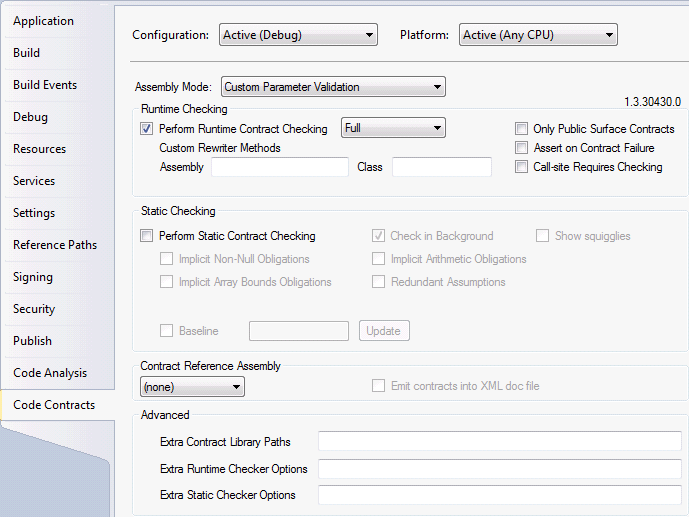 This pane provides configuration options for both static and runtime contract checking. A .Net framework version prior to 4.0, the System.Diagnostics.Contracts namespace is in the Microsoft.Contracts.dll. The .Net framework version is 4.0, the System.Diagnostics.Contracts namespace is in the mscorlib.dll. around a couple of different techniques of constructing a class object. Should we prefer constructing an object by providing public access to its members and initialising them external to the class, like the Builder pattern does? Or by initialising the objects members within its constructor, I.E. like the Factory Method and Abstract Factory does? My take on this, was that it would be best object oriented practice to keep the initialisation of the objects members within the constructor if possible. As far as I’m aware, there seems to be more support for the “keeping initialisation within the constructor”. Initialise all member data in all constructors, if possible. Initialising all data members in all constructors is an inexpensive defensive programming practice. Initialise a class’s member data in its constructor. Just as a routine’s variables should be initialised within each routine, a class’s data should be initialised within its constructor. 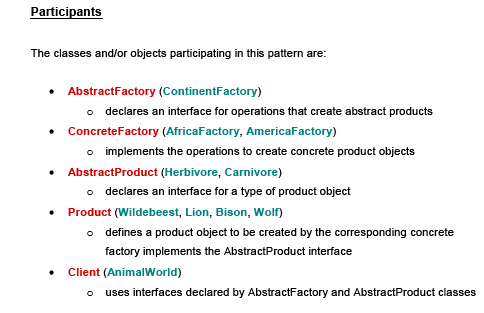 Builder pattern verses the likes of the Factory Method and Abstract Factory. Notice the Frequency of use for the Builder verses the other two? You can get code examples here if you’re not familiar with the patterns. Any feedback on what people think about the before mentioned approaches would be great.